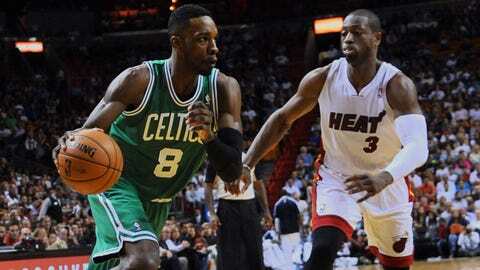 The Heat return from their road trip hoping to get back into form against the visiting Celtics. Following a tough six-game road trip, the Miami Heat return home for a week before beginning another long stretch of games outside of South Beach. They hope their defense is waiting for them there. After one of their worst defensive efforts of the season, the Heat will try to right the ship when they open a four-game homestand Tuesday night against the struggling Boston Celtics. The Heat (29-12) allowed their second-most points of the season in a 121-114 loss to Atlanta on Monday to conclude a 2-4 trip. The Hawks shot 51.9 percent, scored 71 first-half points and had seven players score in double figures. Even with LeBron James scoring 30 and Miami making 45.5 percent of its 3-pointers (15 for 33), the failures on the defensive end were too much to overcome. "We scored enough points to win, so obviously it was defense," James said. "Especially in the first half." Miami allowed 103.8 points per game during the trip, which ranks in the bottom-third of the league since Jan. 9, and opponents shot 48.4 percent. About the only positive on the trek was James, who averaged 29.7 points. The two-time reigning MVP, though, was more worried about the team’s performance on the other end of the floor. "I can’t just pinpoint what it is," James said. "It’s a little bit of everything. At some point we’ve got to figure it out. It’s just not good basketball right now." The Heat will next face a Celtics team that has had major troubles of its own, even with Rajon Rondo back in the lineup. Boston (14-28) has lost nine in a row on the road and 14 of 16 overall. Rondo, who missed the first 40 games while rehabbing ACL surgery, is averaging 7.0 points and 4.0 assists on 36.8 percent shooting in 20.5 minutes since returning Friday. "It is disappointing we lost, period," said forward Jeff Green, who led the way with 22 points. "We gave ourselves a chance. We stayed in the game and fought. (Against the Heat) we have to try and make a play at the end." This matchup will allow Joel Anthony to face his former team for the first time. Anthony, who started 110 games during his six-plus seasons in Miami, was sent to the Celtics on Wednesday in a three-team trade. Though he has yet to play for Boston, coach Brad Stevens has already seen the center’s value. "The thing I already know about him is he is a great person to have on our team," Stevens told the Celtics’ official website. "I am thrilled that he’s here. Practice-wise, in the locker room, personality. Clearly he’s a person that trains and works the right way." Following this homestand, Miami plays seven of its next eight on the road.